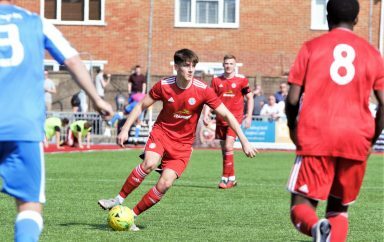 Worthing led 2-1 with nine minutes to go but in the end were grateful for a stoppage time equaliser from Jalen Jones, as a see-saw game ended three-all. 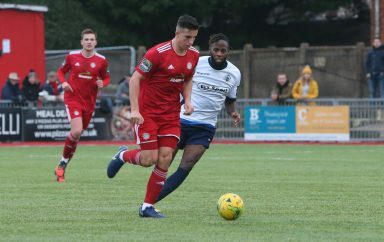 David Ajiboye’s ankle injury kept him out again, so Josh Gould came in for his full first team debut, while Darren Budd started in place of Joel Colbran. Hayden Skerry and Dylan Jelley retook their places on the bench. The hosts seized the early initiative, with Zack Newton forcing the opening save from Billy Bishop, as he tried to chip the visiting ‘keeper. It didn’t take long for the away side to respond and Jalen Jones was called upon twice in as many minutes to clear the danger. Helped by a combination of James Crane and Darren Budd on one occasion. Those warning signs weren’t heeded though, as Ricky Aguiar conceded a free-kick in a menacing-looking position and Tommy Bradford powered an effort over the wall and the outstretched hand of Kleton Perntreou, into the far top corner, from an inside-right position. Achieving his one hundredth goal for the club in the process. Midway through the half and an aerial duel between Harry Ottaway and Ross Edwards, saw the ball fall ideally for Dixon, only for him to make rather a hash of his shot, upon reaching the box. He was presented with another chance moments later, when a slip by Budd let him in but Jones was there once again to ensure nothing came of it. Bishop made a rare save just past the half-hour mark, as he got down low to push away Ollie Pearce’s free-kick, before neat approach play started with Alex Parsons laying the ball inside to Budd who, in turn, picked out Crane on the left and his nod onto Pearce almost produced the equaliser but the number ten couldn’t quite get his header on target. Academy starlet, Josh Gould went closer still to marking his full debut with a goal, with Bishop having to be alert to tip his curling effort over the bar; drifting across his marker on the edge of the area, once Pearce had played into him. The next opportunity fell to Ollie seconds later, as he cut in from the left touchline and landed a thirty-yarder on the roof of the net, leaving Bishop a relieved man. Bang on forty-five minutes, Worthing restored parity. Good skill and persistence paid off for Crane and his subsequent delivery saw Pearce flick it on to an unmarked Aguiar, on the edge of the box and his well-struck, half-volley rocketed into the top corner of the net, via the boot of the unfortunate, Kalvin Morath-Gibbs. 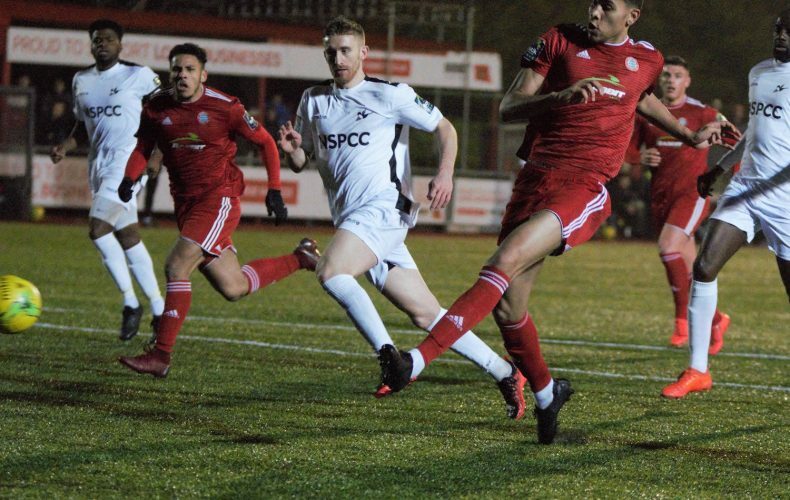 There was still time before the break for Carshalton to cause one or two alarms in The Reds’ defence, as Jacob Mendy twice went close to restoring his side’s advantage. His first effort being kept out by Perntreou and his second pushed onto the crossbar by the busy netminder. The Robins didn’t mess about in the opening exchanges after the restart, with first-half substitute, Ricky Korboa seeing his shot comfortably held by a falling KP and Ben Cheklit nearly capitalising on a lucky deflection off the heels of Budd; drifting further inside and bending his shot over the angle. A counter-attacking move, lead by Korboa, again, resulted in Jones conceding a corner, that ultimately, proved fruitless and Korboa tried his luck from distance, with an even less successful outcome than before, a considerable way out from goal. Ottaway then poked wide, before being usurped by the ever-impressive, Gould. Pearce commenced the build-up on the left and, when his attempted one-two with Zack Newton didn’t quite come off, the ball was laid back by Budd to the “debutant”, who proceeded to work it onto his left foot and fire home, low past Bishop, inside the near post, from an inside-right standing, just outside the ‘D’. That could, of course, have been that but, the final ten minutes produced three more goals. Firstly, Christie Pattison – on for the wonderfully-named Noe Vendrells-Parcerisa – twisted and turned in the penalty area and drilled a perfectly-placed shot in off the far post, for the second equaliser of the night. Then, a risky pass out from KP, put Edwards in trouble and his miscued clearance was pounced on by Korboa, who got to the byline and crossed for Bradford to score one of the easiest goals of the season. With their tails up, Pattison had a chance to put the seal on an away win; only to smack a low attempt against the same upright that had earlier been so kind to him, as he watched on in agony and saw the ball rebound back out for a goal-kick. An end-to-end evening’s entertainment was finally settled in added time, when a defensive clearance made it no further than sub, Billy Barker, who headed forward to Edwards and his hooked effort fell perfectly for Jones to tuck home, like a seasoned centre-forward.